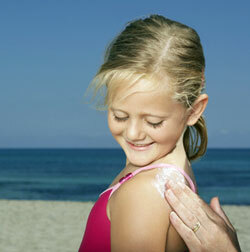 Use sunscreen whenever you are outside during daylight hours. Even on cloudy days or in the winter, harmful ultraviolet rays can damage your skin. About one in five Americans will get skin cancer, but using sunscreen can reduce your chances. Use the right sunscreen. The Academy recommends a broad-spectrum sunscreen, which protects against UVA and UVB rays. They also recommend that you use a water-resistant sunscreen with an SPF of at least 30. Don’t use a sunscreen that is too old; sunscreens retain their effectiveness for about three years. You can use lotion, cream, gel or spray sunscreen, though if you use spray, make sure to get full coverage. There are special sunscreens for young children, people with sensitive skin, etc. Apply it correctly. Most people don’t use nearly enough sunscreen. You should use at least an ounce – or a shot glass full. Apply it 15 minutes before you go outside, and reapply at least every two hours or after swimming or sweating. Make sure to apply sunscreen to any part of your body that will be exposed to the sun, including your ears, hands, etc. Don’t apply to your mouth, but use a lip balm that includes sunscreen, because your lips also can get sunburned. There is no evidence that a sunscreen with an SPF above 50 is more effective than one with an SPF of 50. No matter how high the SPF, you still should apply every two hours or after swimming or sweating. The same is true for moisturizers than include sunscreen. The Academy does not recommend using insect repellent with sunscreen, because sunscreen needs to be applied frequently, while insect repellent should be used sparingly. Try to stay out of the sun entirely during the middle of the day. Get in the shade especially between 10 a.m. and 2 p.m. Consider wearing clothes that protect against the sun’s rays. Hats also can help protect your face and the top of your head. Use extra caution around snow, sand and water, because they reflect the sun’s rays, which increases the chance of sunburn. Finally, the Academy urges you to follow your doctor’s recommendations for skin checks by a professional. On a regular basis, check your own skin and let your doctor know if you see anything unusual.